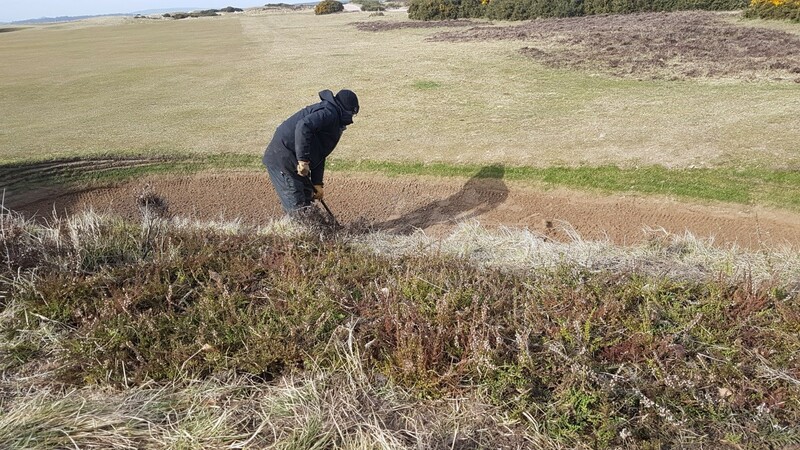 With the sound of birdsong and the growing season upon us, this time of year is always a busy one for the Old Course environmental team. Over the spring, we’ve been busy maintaining habitats and creating new ones. The aim is to take full advantage of our ‘out of play’ areas creating homes for the plethora of flora and fauna which rely on the Links landscape for food and shelter. 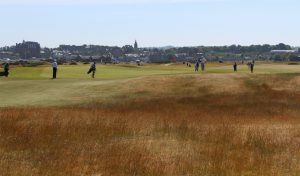 Did you know the whole area of St Andrews Links covers roughly 370 hectares? Around half of this is managed for the environment so needless to say there’s plenty to do! Nurturing the Links’ ecosystem is beneficial to our wildlife but it also creates a more enjoyable experience for the golfer and general public. 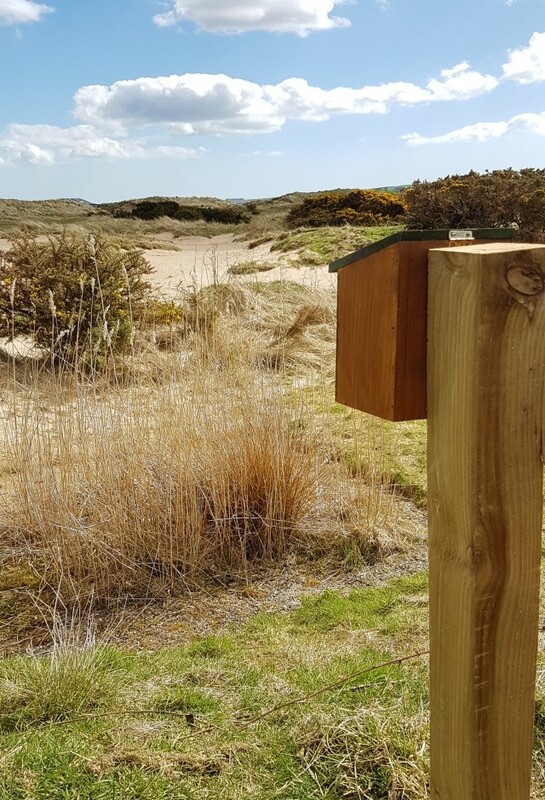 This year, the Old Course reed bed area has had two new bird boxes and a bird feeder added. 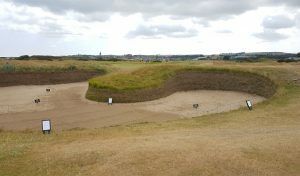 This is actually adjacent to a new sand scrape on the right-hand side of the 14th hole of the New Course. We intend to sow some wildflowers in this area as well (pic above) and hopefully this will become another hot spot for wildlife. In a way, we have created our own microcosm of the Links’ larger habitat mosaic! The reed bed provides a water source for animals and the sand scrape a habitat for mining bees as well as a chance for some birds to give themselves a sand shower! The wildflowers provide a source of nectar for pollinating insects (which hopefully includes some bees from our six beehives – one pictured above) and of course our own bird boxes and feeders will help the already numerous birds which use this area. 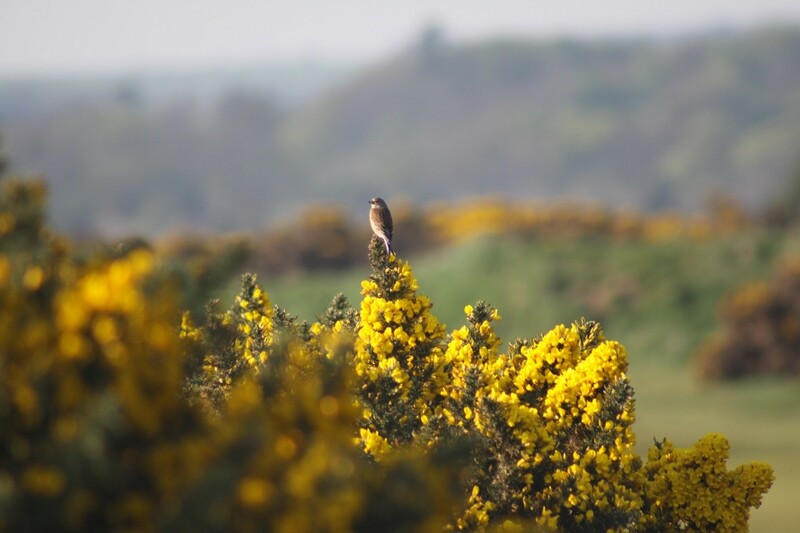 Reed buntings, yellowhammers, chaffinches and linnets (below) can regularly be seen perched on the gorse close by. 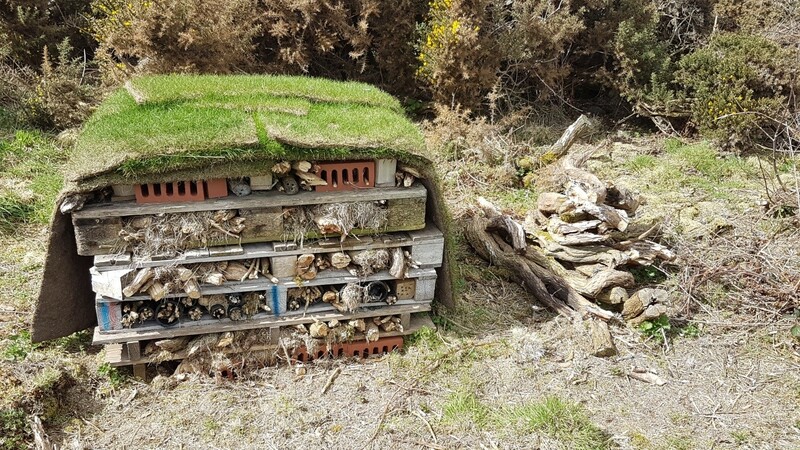 We have also built a bug hotel (below) at our turf nursery near the 7th hole on the Old Course. Using materials lying around our work sheds such as pallets, old pipes, sticks and bricks, we’ve created a safe haven for all kinds of little beasties! Many of these creatures (such as beetles, centipedes and spiders) either breed or hibernate in similar naturally occurring dark havens. Invertebrates such as solitary bees can use the hollowed out pieces of wood and bricks as their nest. 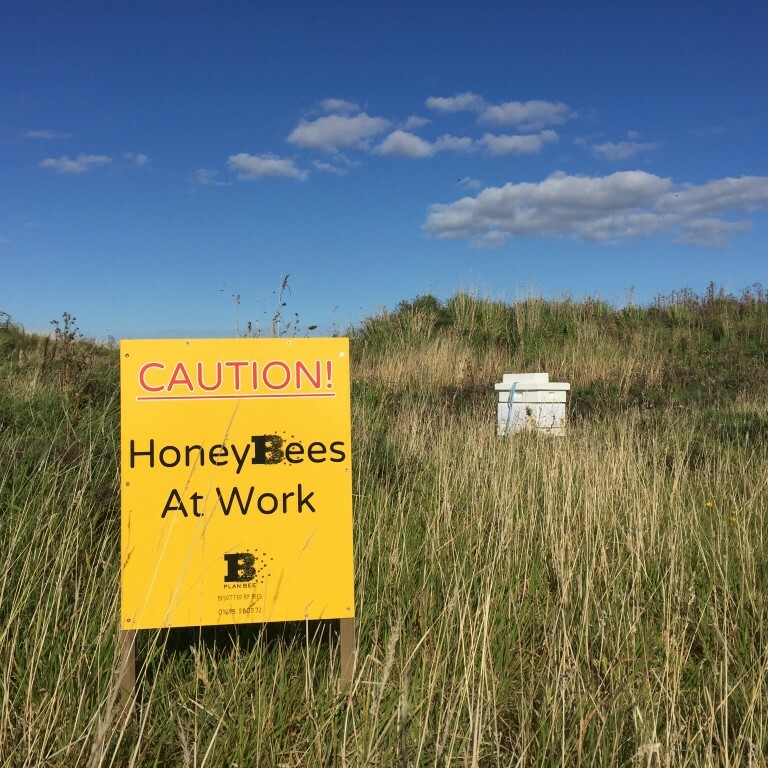 As these and other types of bees are declining in the wider countryside, creating a safe space for them is important. Problems such as large commercial farming and the resulting loss of hedgerows all have an impact on the loss of habitat for small insects so every little helps! We also have another bug hotel on top of our water tank at the Jubilee Greenkeeping Sheds. Wildflower areas are being trialled too in suitable areas around the course. Wildflower mixes containing seeds of flowers which are native to this area (some can be seen growing in our rough already) are always chosen. These benefit the wildest pollinators and species such as birdsfoot trefoil and vipers bugloss, each enhance the natural colours of this coastal landscape. We’ve also been busy again managing the heather and gorse on the Old Course over the winter period. Our aim always is to create healthier more ecologically beneficial ‘stands’ of both as well as enhance the playing experience for the golfer. Mature stands of heather were topped to allow for fresh regrowth and young gorse sprigs were hand picked out of many of our heather areas. More heather was planted behind a bunker on the left hand side of the 9th fairway and hopefully this will survive and flourish (pic above). 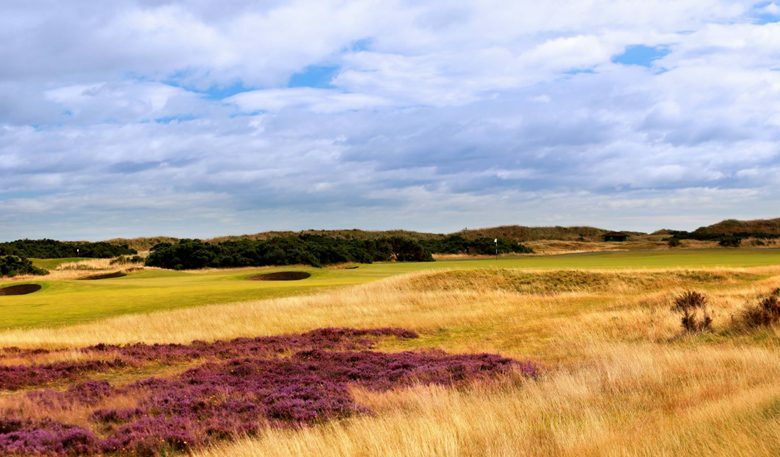 The heather was sourced from our gardeners here at St Andrews Links who grew a large amount of heather from seed in small pots. We continue to forge strong links with the surrounding community and our work on the West Sands dune restoration continues to be a real success. 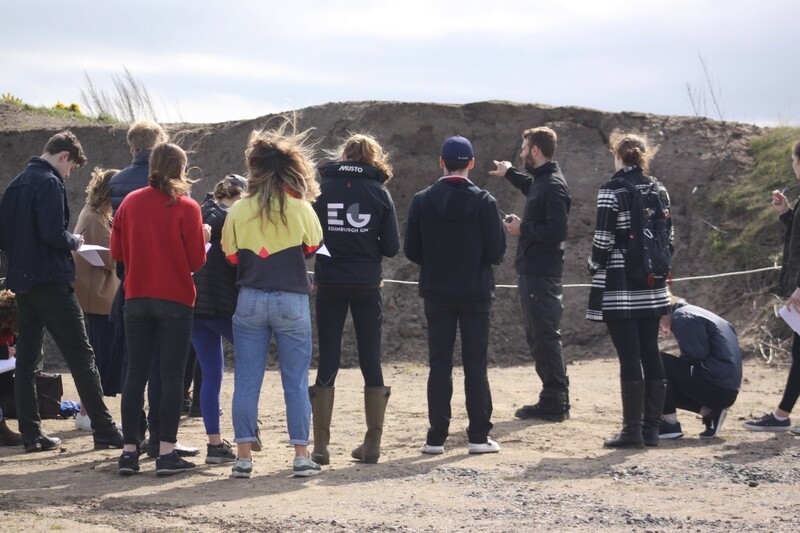 Last April, sustainable development students from St Andrews University joined us for a course walk to learn about the environmental practices we carry out here on the Links (pic above). It was a fantastic experience to share and discuss environmental and sustainability issues with the students. Topics from recycling to our water and habitat management work were discussed. 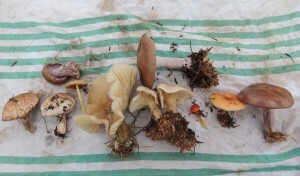 With summer upon us, it’s exciting to see the fruits of our winter work materialise and plan for more improvements!